The Intermatic Ascend STW700W Smart In-Wall Lighting Timer complements retrofit and new construction smart home installations. 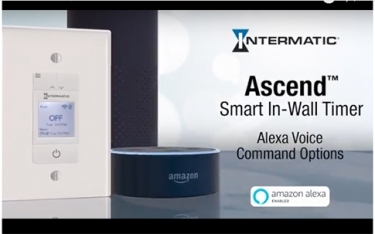 One of the many user-friendly options built into the Intermatic Ascend STW700W In-Wall Lighting Timer is the ability to control the lighting device using voice commands via Amazon Alexa. The new Intermatic Ascend STW700W Smart In-Wall Lighting Timer enables streamlined energy efficiency in a variety of home environments. Intermatic developed its latest smart-home solution to integrate into production home settings, retrofit installations, or any type of household needing efficient lighting control. The STW700W installs in a matter of minutes in both new construction and retrofit applications. Integrates into new homes and retrofit construction environments. Programs with or without the aid of Wi-Fi. The UL-listed product features battery backup. Intermatic's app is available on the iOS and Android platform and it allows for on-the-fly programming. We turned off power to the old lighting switch, removed the standard light switch, and quickly reconnected the Intermatic product, which includes a companion wall plate. The combination of the devices' backlit display and a mobile app gives installers options during installation. Using the app does expedite the setup process thanks to a choice of preconfigured scheduling templates (and the ability to set up custom schedules), but it is not a necessary component of the save and repurpose process. The app is available for both iOS and Android devices. Once the scheduling is set up, the app can be used for remote, on-the-fly scheduling changes, and homeowners can also control the product using voice commands if they have an Amazon Alexa-enabled device such as an Echo or Echo Dot. The Intermatic Ascend STW700W Smart In-Wall Lighting Timer supports installers in a number of ways. First, the Ascend eliminates the need for a centralized hub or controller, meaning it saves clients the added expense of having to purchase a second device. Next, the timer benefits integrators (and ultimately homeowners) because its functions are accessible from the physical interface without the need for a companion app, which makes it an easier product to use on a daily basis. Moreover, because the STW700W timer is a streamlined solution, it installs into production homes, retrofit, and custom homes easily. Also, don't overlook the timer's industrial design. Taking a restrained approach to its looks, Intermatic helps ensure its timer complements a range of interior designs from an aesthetic standpoint, which allows it to blend into any home without standing out. Through its accessible price point, focused feature set, and ease of installation, the Intermatic Ascend STW700W Smart In-Wall Timer is a versatile lighting control solution for nearly any home. Does this require a neutral? Hmmm. “lighting switch” sounds like more than an ordinary SPST. Rats. It’s just an SPST. Probably. The author doesn’t make this clear. It’s important to know whether this product requires a neutral. Lack of a neutral, which is the usual situation in a light switch box, would preclude use of this product. It’s a really important thing to tell us in the article.